>> Top 5 Best Trampolines For Kids! We all love trampolines! There’s just something about being able to jump higher than you normally can. But trampolines are not just about fun. Studies show that they offer physical and educational benefits, too. Let’s discover the reasons you should have one at home, and together, let’s find out what the best trampoline for kids is! We’ve only included trampolines with enclosures on our list because we believe that they are the safest for children. If you’re all set, let’s check out our top five trampolines for kids! If you’re looking for an entry-level trampoline, then the SportsPower My First Trampoline might be the perfect one for you. It’s supported by a durable steel frame that’s made of galvanized steel tubes integrated into a steel and blow-molded plastic tube leg. Made for both indoor and outdoor play, the jumping mat, PE netting, and, spring pad protectors are UV-resistant and could withstand the heat during the summer. It’s a hexagonal trampoline with a three-arch safety enclosure, ensuring that your child stays safely in his trampoline when playing. It has a maximum weight capacity of 100 pounds, so once fully assembled, your children won’t be disappointed with it at all! It has a compact design and is perfect for small spaces. All the metal parts are covered in plastic and foam. It’s one of the cheapest models available but gets the job done as the more expensive ones. The instruction manual for assembly may be a bit confusing. Next on our list is the SkyBound Super 7. It’s a hexagonal trampoline designed for both outdoor and indoor play, featuring a bright color scheme that will attract any child. It’s supported by a galvanized steel frame constructed for rigorous everyday activity. The enclosure net for this trampoline is backed up by three frame arches covered by thick PVC padding to keep your kids off the spring. Speaking of spring, the Super 7 uses thirty-six 5.5 premium-quality springs proven not only to be bouncier but more durable than regular springs. Meanwhile, the enclosure net of the Super 7 is reinforced with a dual zipper, allowing your kids to enter and exit with ease. Finally, this trampoline stands on three uniquely designed legs, suitable for outdoor and indoor surfaces. Each leg is covered in plastic shells to protect sensitive flooring and carpets. The weight limit for the Super 7 is 220 and lets one adult play with the child inside. The springs are well covered so your children can jump safely. 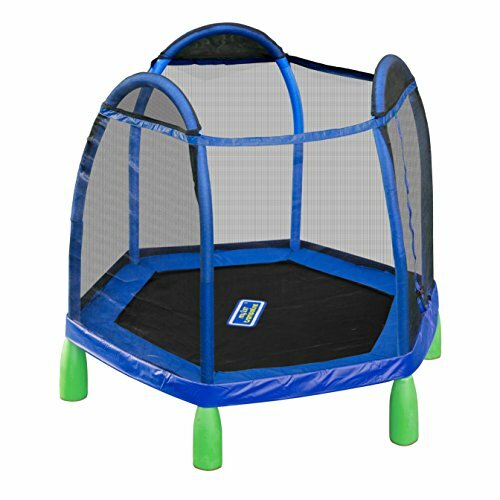 Overall, this trampoline looks great, is sturdy, and is easy to move around. Some portions of the assembly instructions can be a bit difficult to understand. Skywalker is one of the most well-known makers of trampolines. 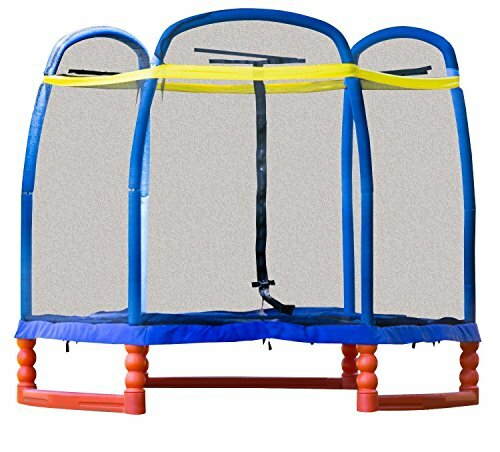 Their 8-feet round trampoline with enclosure is one of their best models as it offers superior construction and innovative design. 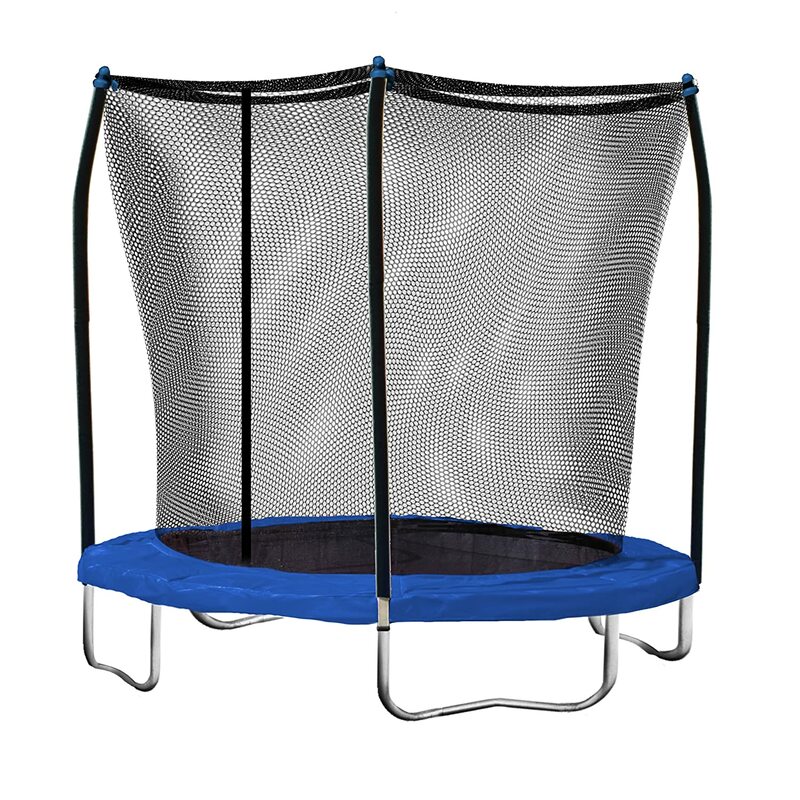 Its springs are rust resistant and provide a smooth jumping experience for your kids. 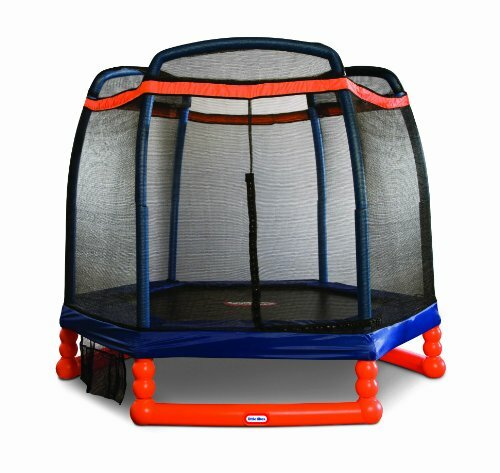 The frame for its safety enclosure connects to the frame of the trampoline at the joint of each leg through T-sockets. This innovation keeps the frame from twisting. The enclosure also uses a ‘button hole’ feature that connects the net to the jump mat, eliminating gaps and improving safety. Meanwhile, the metal frame is curved so that it doesn’t touch the net and keep your kids from hitting it. It’s also covered with a safety pad just in case. It’s low to the ground and just the right size for one kid to jump on. The net is sewn into the trampoline, so your kids won’t fall out. This trampoline is well made and is sure to last for a very long time. Assembly of this trampoline can be a bit challenging. The Little Tikes 7 is also a hexagonal trampoline just like the Super 7. 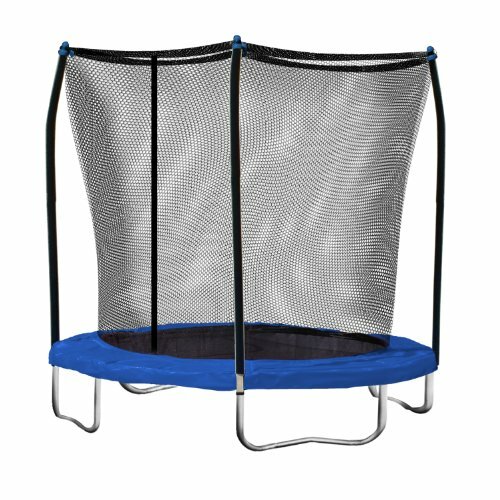 Its frame is made of blow-molded plastic combined with steel, assuring you that this outdoor trampoline is built to last. To keep your kids safe while playing, the Tikes 7 features a safety enclosure made of PE netting that’s supported by high-quality and heavy-duty steel poles. The safety springs are also covered with durable pad protectors to make sure your kids don’t get injured while they’re playing. And unlike most models out there, the Tikes 7 features a shoe storage underneath, so your children’s shoes and their friends’ shoes can be neatly stowed before they enter the play area. Cool, huh!? It’s definitely built for the outdoors and could withstand both heat and cold. The base is low to the ground, adding an extra sense of security. It’s very easy to put together especially with the special tools that come with it. The color of the fabric tends to fade quickly. The Zupapa trampoline comes in 12-, 14-, and 15-feet models. For kids, the 12-feet model should be enough to get the job done. All Zupapa trampolines are TUV certified and feature more springs than most standard models. The 12-feet model, for instance, comes with 72 springs instead of 60. The steel frame, too, is made of rust-resistant galvanize d material. Also, the poles are much longer than usual and are designed in such a way that makes the trampoline sturdier and safer to jump on. The jumping mat, on the other hand, is UV protected, which means you can expect it to last outdoors despite the weather. 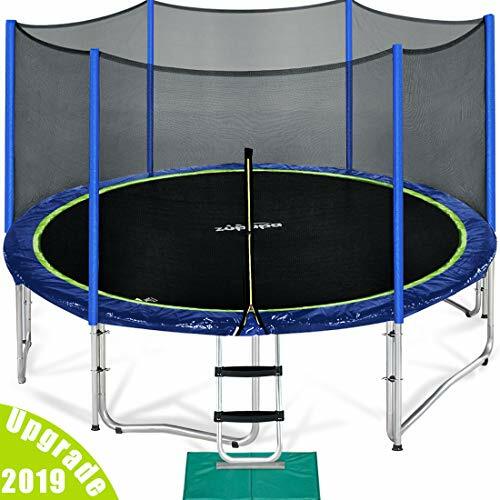 And with a 330-pound weight capacity for the 12-feet and 14-feet model, this trampoline is sure to provide your kids and even the entire family tons of jumping and bouncing fun! You’ll love how responsive and outstanding the customer service of this company is. It’s packaged and organized with ease of assembly in mind. Everything you need for the assembly comes with the package. You’ll want to make sure you tighten the covers, or they’ll accumulate water when it rains. Among the top five trampolines on our roster, the Skywalker 8-Feet Round Trampoline caught our attention the most. Yes, it’s a bit challenging to assemble, but that just tells you how much attention to detail has been given to it. We loved the fact that the four poles that make up the frame are bent at an angle because it allows a bigger and a safer place for the kids to play. The base is also low to the ground so your kids won’t need a ladder to climb onto the jumping mat. It’s also good to know that it’s low enough and gives you peace of mind that your child won’t hurt himself that much just in case he falls off. But with the safety net enclosure, we don’t think that would even be possible. What’s even interesting is that the net is sewn into the jumping mat, so there’s really no way your child is going to fall off to the sides. It’s a common problem with other models, but not with this one. Without a doubt, you and your kids will surely be impressed with the performance of the Skywalker round trampoline. We’ll show you here a short video of our top pick. It’s not particularly the 8-foot version, but it should give you an idea how safe and exciting this model is. Do you have difficulty convincing your little ones to exercise? Worry no more. With a trampoline at home, they’ll be exercising in no time without knowing it! Jumping on a trampoline is fun, and kids are all about fun. That’s the best thing about a trampoline! It gives your children the opportunity to move physically without them feeling the pressure of being forced to do so. Jumping on a trampoline requires the brain to function bilaterally. The reason is that both sides of the brain and the body must work in order for the body to maintain balance and coordination. The more your kids play on a trampoline, the more they develop their motor skills. Playtime is crucial to a growing child’s learning process. In fact, studies have shown that the more physically active a child is, the better he will do academically. Exercise such as jumping encourages the brain to work at its optimum capacity. It helps the nerve cells in the brain to multiply, as well as strengthen their interconnections and protect them from damage. Many athletes use trampolines to improve their motor skills. If athletes who are already physically developed still find trampolines beneficial, how much more should we encourage our kids to use them? Whether or not your child is involved in any sport, getting him a trampoline will him sharpen his athleticism. Trampolines are fun, but they come with safety risks, too. To provide an experience that’s both enjoyable and safe for your children, there are several things you need to do before buying a trampoline for them. According to statistics, 37% of patients evaluated in emergency rooms after trampoline-related incidents are children. This is something that shouldn’t be ignored by any parent. It’s important that you know this fact before getting a trampoline for your family, so you can take the necessary steps for reducing the risks associated with trampolines. Kids love adventure, and for them, a trampoline is not adventuring enough. If they could add more to the excitement like jump off a roof onto a trampoline, they would do so. The key is to place the trampoline where your kids won’t be tempted to experiment with activities that would bring them danger. It’s also important to find a spot where they won’t hit their heads as they jump. You should also make sure there aren’t any hard surfaces where they could land in case they fall off. Setting rules is one of the most effective ways to lessen the chances of accidents. For instance, only kids six years old and above should be allowed on the trampoline, and they can only play under adult supervision (one of the most common causes of accidents involving trampolines is that no adults were watching over the kids). Also, only one person is allowed to jump at a time. Finally, no one is allowed to perform flips and somersaults. All trampolines serve one purpose regardless of the brand. However, some brands add extra safety features to their products. Before making a purchase, make sure you know what you’re getting. The safest trampolines have safety pads to cover the springs. They also have springs that are designed to prevent injuries and entrapment. Most importantly, they are constructed with a secure frame and feature a net that keeps kids from falling. You probably have your own pick of trampoline from our top five list, so why don’t you let us know what it is in the comments section. And you think this post has been helpful, don’t think twice of sharing it with your social circle! Thank you!